Hair loss is a widespread phenomenon amongst men and women today. Vast chunks of the population are facing hair loss, hair fall, and thinning due to added stress, responsibilities, pollution, ill-maintenance, medication, and genetics. According to Civilized Health, if you lose 10 – 11 strands of hair a day, then it is considered a natural process. But if you miss more than 40 strands of hair a day, you are facing hair loss. For men, few hair follicles falling off each day is perfectly alright due to travel, dust, and sweat. Men also tend to lose hair due to headgear like helmets, caps, or hats. Hair loss could also be due to deficiencies in diet and not enough mineral intake. 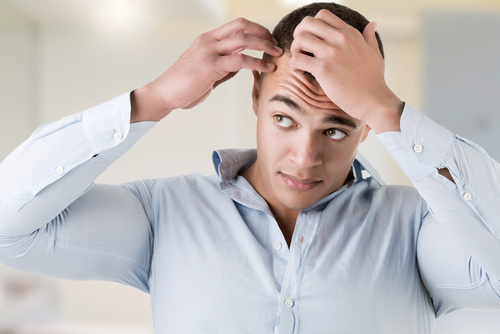 Let us look at a few ways to tackle hair loss for men. Due to the excessively fast routines and work lives, most men forget to drink water. Hair follicles are made up of almost 20 – 25% water. Staying hydrated throughout the day helps in strengthening the hair and promotes healthy and rapid growth. Dehydrating the body can result in weak and brittle hair that snaps and breaks quickly. Not drinking enough water can also cause a gradual hair thinning problem and hair could get scanty. The best way to tackle hair loss is to ensure your hair is getting plenty of vitamins. Vitamins are great for health but especially fabulous for hair. Vitamins like A, B, and E help hair growth tremendously. Vitamin A promotes the production of healthy sebum (naturally occurring hair oil). Vitamin B helps retain the original color of your hair without going grey prematurely. Vitamin E improves blood circulation to the scalp and the rest of the body thereby ensuring steady production of hair follicles. Man buns and other hairstyles for men can cause a hair condition called traction alopecia that causes hair loss. Man buns are hair buns like women but tied under a lot of tension. The tension, pulling, and resultant strain on the scalp and hair follicles causes thinning and falling of hair. While this might not seem too pertinent for the younger generation, these results usually show up later in life. There are plenty of hair therapies available in the market today. The common ones are hair transplants, cell therapy, laser light therapy, and medicine or drug therapy. Scar-less hair transplants are the most popular ones since hair is only transplanted to the head from areas on the scalp that have denser growth. Cell therapy or PRP (Platelet-rich plasma) is a treatment by which small amounts of the patient’s blood is injected back into the scalp to promote natural hair growth factors and quick healing. The patient’s blood is extracted, spun in a centrifuge, and the platelets rich with plasma are injected back. Laser light therapy uses the help of lasers to encourage proteins in the roots of the hair to promote hair regeneration and growth. Men who notice hair fall at the start can significantly benefit from this treatment to stop hair loss almost wholly. Drugs and medicines, such as Propecia, are available in the market that can arrest hair fall and promote hair regrowth. Mild shampoos and conditioners can help keep the strength of hair high. Men tend to avoid cleaning their hair with shampoo and use running water to cleanse their scalps. By using shampoo on the hair, you are lowering the risk of infections, ticks, sweat mites, and dandruff. All these conditions also lead to eventual hair thinning, hair fall, and hair loss. Also, clean hair looks voluminous and shiny, whereas dirty hair looks dull, flat, and sometimes oily. Use shampoos that contain trace amounts of aloe vera to keep hair healthy. Smoking causes a reduction in the oxygen carrying capacity in the blood and causes the scalp to receive less oxygenated blood. This creates an increase in hair thinning and hair fall and a reduction in hair growth. Alcohol has been noted to cause an increase in hair loss. To check if hair fall is due to alcohol, stop drinking for a few weeks and observe the difference in the texture, quality, and follicles. With hectic lifestyles, work, travel, and stress, hair fall is a common occurrence. De-stress by working out and getting the blood flow pumping. Reducing stress levels through physical activities like swimming, biking, running, or jogging helps in increasing hair growth and keeps you active. Men who practice yoga, meditation, and breathing techniques have been able to battle stress and rejuvenate hair growth successfully, says Camille from The Float Spa.